In God We Trust…… Maybe. | "Northern Crossings"
One of the things we have in common up here in the North country is a lot of Lutherans from a lot of different persuasions have participated in government. Both Minnesota and North Dakota history is replete with Lutherans who have participated in government at every level. Some have been governors, some have run for governor, in fact a member of my church in Drayton ran for Governor of North Dakota and almost won, many participate in the legislatures. One of my friends said that the participation of Lutheran‘s in State government did not always resound to the glory of either Lutheranism or government. Be that as it may Lutherans recognize participation in civic life is a duty and can be a vocation. 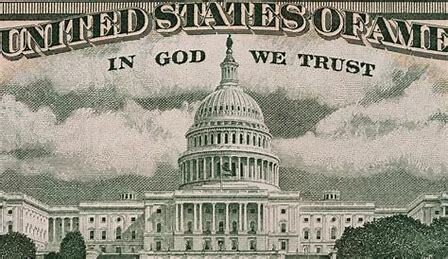 A contretemps erupted it at the state legislature in Minnesota the other day over a bill that would allow schools to publish somewhere on there property the model that we find an all of our money – “in God we trust”. One of the law makers said a God who “ spoke against money is the God whose name is supposed be on the money I carry around in my wallet”, or something to that effect, found the whole idea offensive. Of course the gentleman has his opinion and that opinion is well taken, but I’m not sure exactly what he’s talking about. Jesus never really speaks against money but he talks a lot about the offense that is the love of money. His remark about the coin of the realm, the denarius, and asking whose inscription and whose signature is on it I am sure had more than a little sarcasm to it. “Render unto Caesar the things that are Caesar’s, and unto God the things that are God’s” according to some people I have read, could be translated “if this guy cares so much about this stuff that he has to plaster his face and name on it, then give it to Him. But give to God the things that are due to God. Worship and respect Etc. many of its members of being more interested in politics then in theology and religion. The leaders of the church body have been accused of being more concerned about the kingdom on the left than they are about the kingdom on the right. That is a discussion for another time. For now let it be noted that it is possible to be a Christian and to make a public stance on an issue that convinces others that you are not a Christian at all.